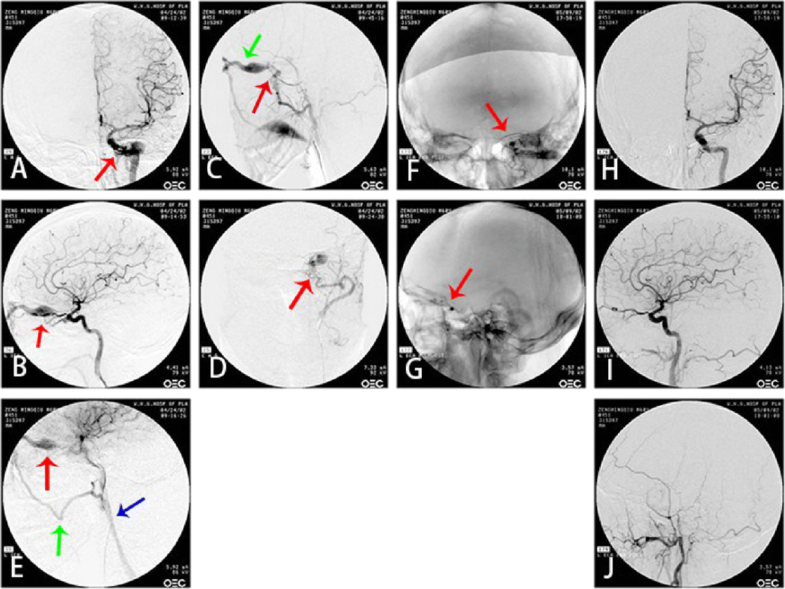 In the past, the cavernous dural arteriovenous fistula was categorized as spontaneous cavernous carotid fistula  due to the lack of knowledge and limitation of imaging equipment. In the recent time, with the accumulation of knowledge of DAVF’s etiology, mechanism, physiology, clinical symptoms and imaging data, the diagnostic methods and treatment have achieved novel understandings and progresses. In fact, it’s a specific type of dural arteriovenous fistula---- cavernous dural arteriovenous fistula. The purpose of this paper is to tell the difference between cavernous dural arteriovenous fistula and traumatic carotid cavernous fistula, and to redefine cavernous dural arteriovenous fistula from the aspects of etiology, mechanism, pathology, clinical symptoms, DSA characteristic and therapy. DAVF is an independent disease. The Cavernous dural arteriovenous fistula can not be classified as spontaneous CCF any longer, but a specific type of DAVF--- cavernous DAVF. 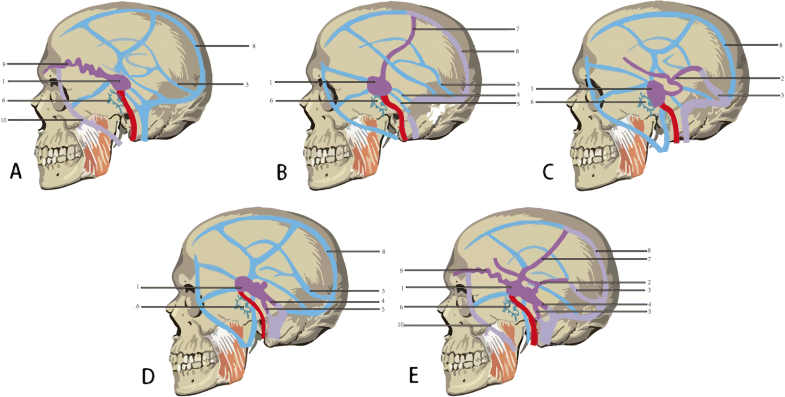 TCCF is mainly caused by trauma and skull base fracture. CS-DAVF is caused by cerebral venous sinus thrombosis, venous sinus hypertension, inflammation, trauma or endocrine diseases, etc. TCCF: Skull base fracture injures the internal carotid artery and its branches, which gives rise to the abnormal communication between ICA and cavernous sinus. CS-DAVF: Multiple reasons lead to the communication between dural neoformative multi-branch arteriole and cavernous sinus through the dural microfistulae. 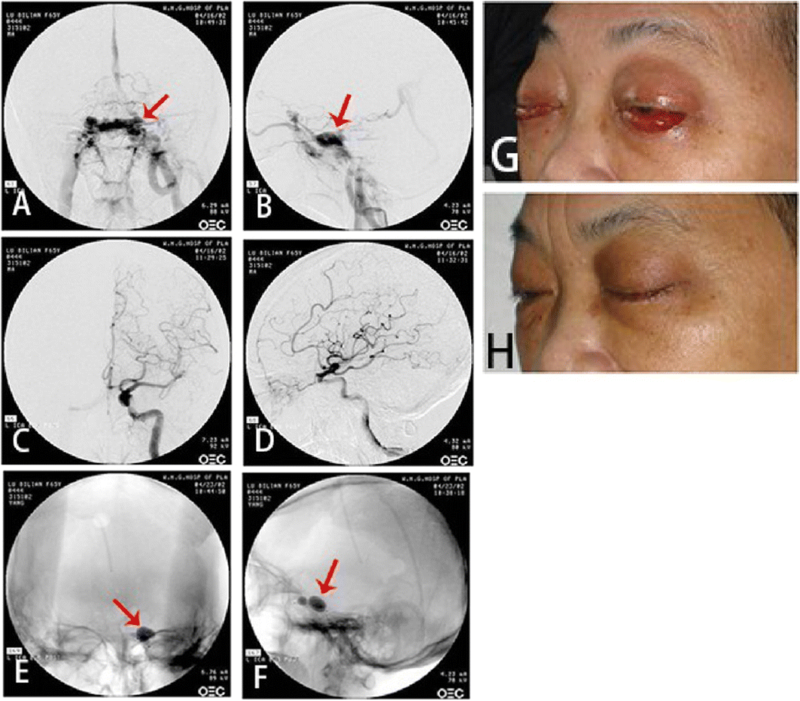 TCCF: The feeding artery is cavernous segment of internal carotid artery or its branch-vessels; In few cases, the feeding artery is the external carotid artery; Normally single fistulous orifice; The draining veins are superior ophthalmic vein, superior petrosal sinus, inferior petrosal sinus,basal veins, cortex veins (labbe, Tralend veins) or mixed-type draining veins (two, three or four veins of the four draining veins mentioned above). CS-DAVF: In most cases, the feeding arteries are the ascending pharyngeal artery, sphenopalatine artery and the middle meningeal artery of external carotid artery. There are also the tiny branch arteries from the meningopituitary trunk feeding the CS-DAVF; Normally multiple microporous fistulous orifices. The draining veins are mainly superior ophthalmic vein, superior petrosal sinus and inferior petrosal sinus. Basal vein and cortex veins are not frequently seen. The contralateral internal (external) carotid artery are often feeders when bilateral cavernous sinuses are involved by the lesion; Stealing symptom is not manifest (Figs. 1 and 2). 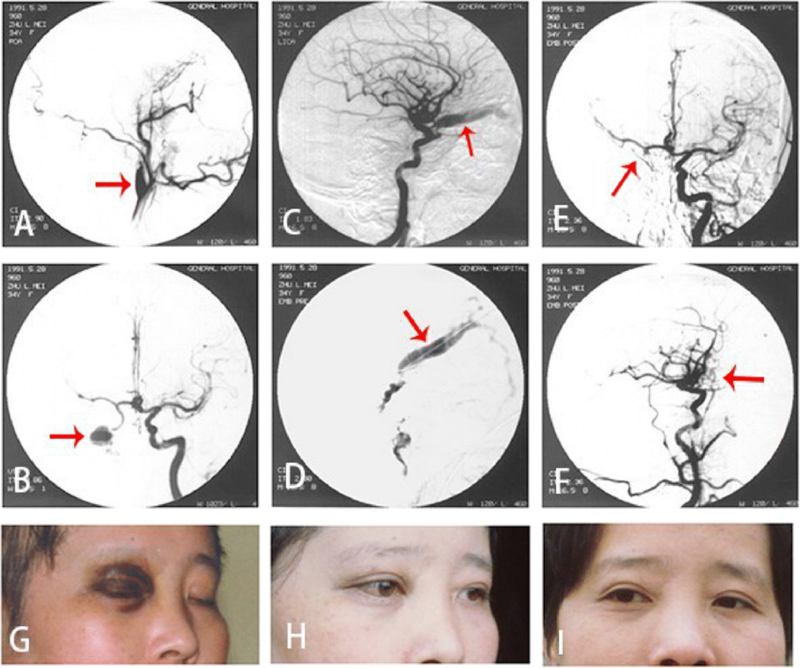 TCCF: intracranial bruit;exophthalmos; obvious hyperemia and edema of bulbar conjuctive and eyelid; elevation of intraorbital pressure; restriction of occular motility; sometimes intracranial hemorrhage or steal syndrome. CS-DAVF: mild and rare intracranial bruit; rare hyperemia and edema of bulbar conjuctive and eyelid; rare intracranial hemorrhage or steal syndrome; easyily misdiagnosed as conjuctivitis. The feeding artery of TCCF is the cavernous segment of internal carotid artery, mostly the horizontal segment. Single fistulous orifice, mostly on the side near skull base. The draining veins are mainly superior ophthalmic vein, superior petrosal sinus, inferior petrosal sinus, sometimes cortex veins and basilar vein (Figs. 3a-i, 4a-h, 5a-d). CS-DAVF: The feeding arteries are the branches of external carotid artery. In some few cases, the branches of meningopituitary trunk feed the contralateral synonymous vessels. The fistulous orifices on the dural mater are multi-microporous, which are naked-eye invisible. The draining veins are mainly superior ophthalmic vein, superior petrosal vein and inferior petrosal vein, which can communicates to the contralateral vessels through intercavernous sinus (Figs. 6a-f, 7a-j, 8a-d). 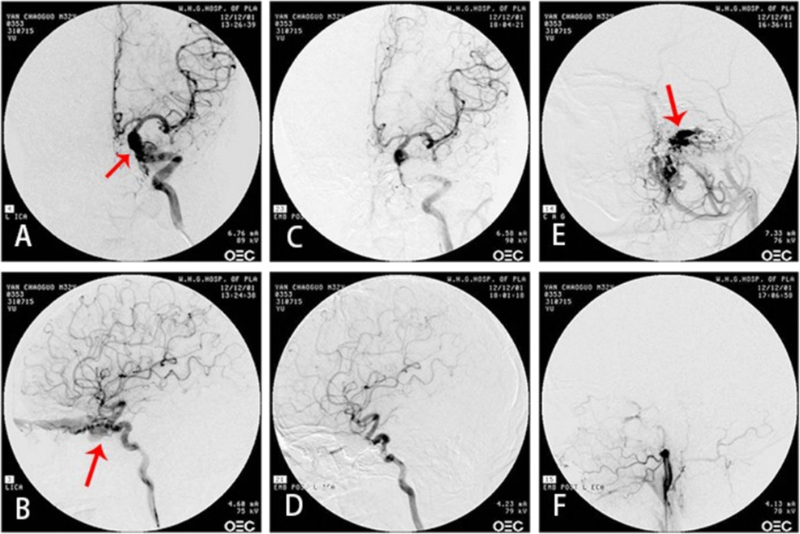 TCCF: Endovascular embolization is the prior therapy and internal carotid artery is the prior approach. But when internal carotid artery approach can not be performed, superior ophthalmic vein, superior petrosal vein and inferior petrosal vein are also optimal approaches. Detachable ballon is the prior embolic material, but in some special cases, coils and onyx glue are also available. Surgical therapy is barely considered. Our hospital has treated TCCF in a total of more than 900 cases. All patients are completely cured. No disability or death is observed. CS-DAVF:Endovascular treament is the first choice for cavernous DAVF . We can choose arterial approach, venous approach or combined approach. Coils plus onyx glue, silk line segments or grubran glue can be chosen as embolic materials. As there are multiple feeding arteries and fistulous orifices, the remaining fistulous orifices can be cured by pressing the CCA postoperatively (2–3 months, 2 times a day, keep pressing CCA for 30 min every time). The treatment of CS-DAVF is rather more difficult than TCCF. However, when choosing the proper treatment, CS-DAVF can be cured and zero death can be reached with extremely low complication rate. Because dangerous anastomasis exists between branches of external carotid artery and ophthalmic artery, vertebrobasilar artery, embolic materials would cause misembolization through dangerous anastomasis when arterial embolizaion is performed. Over-packing with coils would cause ocular muscle paralysis or reflux of liquid embolic agent to artery and their correspondent complications. Our hospital has treated cavernous CS-DAVF in a total of 200 cases since 1900. The longest follow-up is 25 years. No death occurred and only 1 case of right eye blindness was observed. Based on the above knowledge, we suggest that the term of spontaneous internal carotid cavernous sinus should not be used. DAVF is an independent disease. Do not confuse CS-DAVF with TCCF and categorize CS-DAVF as cavernous type of DAVF when we write papers or books. We acknowledge the support of Wuhan General hospital of Guangzhou military. LTM and LP participated in collecting data, and drafted the manuscript. All authors read and approved the final manuscript. The authors report no potential conflicts of interest concerning the materials or methods used in this study or the findings presented.